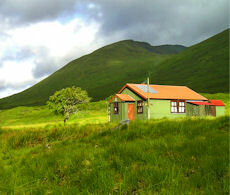 To the north of Kintail and far from view, remote Affric Hostel is tucked away from roads and civilisation. Surrounded by magnificent scenery and towering mountains, including mighty Sgurr nan Ceathreamhnan and A'Chralaig, this is peaceful place close to nature. 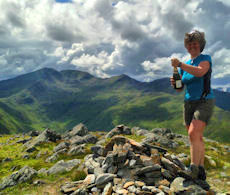 We're here for a blissful 2 night stay in the hostel and 3 days hiking and Munro bagging. Staying two nights in remote Glen Affric Youth Hostel, encircled by mountains and far away from civilisation and the internet ! 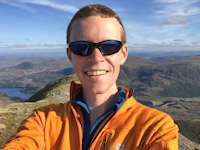 A 3 day guided hiking event over high mountains in the North-West Highlands with one of our experienced and qualified leaders. 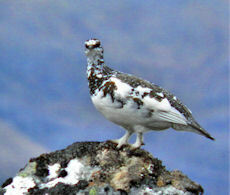 Your guide will know the remote area well and be able to give you insight into the flora, fauna and geology. Above the western end of Loch Cluanie and the 'Road to the Isles', mighty A'Chralaig thrusts upwards from the glen below. Behind this assertive mountain, a fine narrow ridge gracefully leads to Mullach Fraoch Choire with its summit cairn commanding a fine view along Glen Affric. 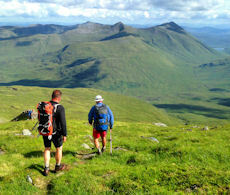 We'll meet by the Cluanie Inn and after sorting out our gear for the weekend, head up the massive dome of A'Chralaig. The slopes are steep and grassy with plenty of places to stop and admire the developing views. Once onto A'Chralaig we have some fine ridge walking northwards, then some easy graded summer scrambling to gain the summit of Mullach Froach Choire. Back on grassy slopes, we drop down to remote Glen Affric Hostel to settle in for the night. The mountains to the north of Glen Affric Hostel are linked together with fine ridges and crests. Sgurr nan Ceathreamhnan is the dominant mountain in the range with Mullach na Dheiragain being one of the remotest Munros in the country. Bright and early, we'll set of on a fine path northwards by the lovely Allt na Faing. Up to the col below Ctob Coire na Cloiche, we'll have a respite from carrying our rucksacks for the short detour to An Socach and back. 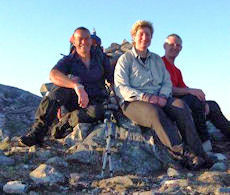 Into really wild country next, we'll hike northwards to Mullach na Dheiragain, surely one of Scotland's remotest peaks ! Hopefully the weather will be kind and we'll enjoy some spectacular ridge-walking up to Sgurr nan Ceathreamhnan's lofty summit. We've a couple of options from here - either take in some easy rock-scrambling to bag the mountain's westerly summit then follow a line of fence posts downhill, or head east for a fine ridge walk before dropping back to the hostel on the path we came up. The return to Cluanie is pretty straightforward, we're on a path, then track most of the way. So, we've included nearby Corbett peak of Am Bathach as an option to extend our day. We'll leave the SYHA Affric hostel behind, cross the well made bridge and walk southwards on a rough path. When we reach the highest point of the path, we can detour to Bealach Choinich and over Am Bathach, which adds only 400m ascent onto our hike. Back to the road, it's off to Cluanie Inn for some well deserved refreshment ! 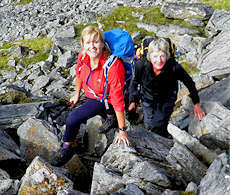 The routes have good tracks and faint paths lower down with generally grassy slopes leading to varied terrain higher up. The first day's hike is classed as a 'moderate day' and has some short sections of easy Grade 1 rock-scrambling to reach Mullach Froach choire. The second day is longer, therefore a 'demanding day' with some rough hiking terrain, whereas the final day with a return over Am Bathach is graded 'moderate'. You'll need your general hiking gear appropriate to the conditions and time of year. More information and a checklist to download can be found on our Mountain Gear page. In addition you'll need a sleeping-bag and a towel if you are staying overnight in the hostel. You'll also need to take enough food for the days. Please have a look at the SYHA Affric Hostel page for more information. Leading the event on 21-23 Jue'19. We'll be starting from the roadside at the western end of Loch Cluanie around 1 mile east of Cluanie Inn. Cluanie Inn is around 45 miles north-west of Fort William on the A87 to Skye. If you need help with transport, please let us know and we'll try to help. On the first and second nights of this event, we would encourage people to stay in the SYHA Affric Hostel. We've not included the cost of the overnight stay in the hostel, as some people may prefer to camp nearby instead, therefore if you wish to stay in the hostel, you'll need to book your own accommodation. Cost of a night in the hostel is £24 for a bed in a shared room. There is the option of a 2 person private room, cost of which is £58. More info is on the SYHA Affric Hostel page.